The last piece of painting anatomy is varnishing your painting if it is painted in oils. No painting step creates more uncertainty and problems for oil painters then varnishing. A varnish layer was added to paintings for protection from chemical reactions from air and sunlight and also dust and soot from household smoke from candles, oil and gas lamps, wood and coal burning stoves and fireplaces. Another benefit to varnishing a painting was the varnish evened the painting out visually. Oil paintings have different pigments drying to different finishes of glossiness. Some were very flat and some shiny. Applying a varnish unified the painting surface and gave the colors a fresh wet look. When varnishing, a thin uniform coat of varnish is preferable to a heavy coat. A heavy coat is actually less durable and more susceptible to decay and problems. The best application is spraying on varnish while the painting is laying flat and then once the varnish has set turning the painting towards a wall face down to prevent dust and other objects reaching the surface. There are a number of picture varnishes on the market, but basically they break down into two camps matte and glossy varnish. The three most accepted materials for varnishes are Damar, Mastic and Acrylic; two of them, Damar and mastic are made from trees the third is an acrylic solution, methacrylate, a polymer that has been used by museum conservators since the 1930’s as a final varnish. Damar and its acrylic substitute have the best properties for picture varnish. Varnishes have other compounds added to them to make them have a matte finish and there is no matte varnish recommended as a final varnish by conservators. The question of when to varnish is a nightmare for painters. According to the material handbook a painting should be varnished sooner than too late. That is, after the oil in the pigment has dried. When using linseed oil, that is about two months’ time in a normal climate. The reason for this is oil paints begin adverse chemical reactions when exposed to air and sunlight. The sooner you seal them from these the better it is for the painting. Another train of thought is to varnish as soon as the painting is dry to the touch and let the varnish age with the painting. This works better if you are using an acrylic varnish which will retain a more flexible structure over time. My best advice is to try some tests and see what kind of results you get. I usually varnish my oil paintings within the first couple of months and I use an acrylic varnish. Thank you. This is really helpful since I would like to start learning oil painting. Thank you for a very interesting and fact filled article, and also why and how you varnish. 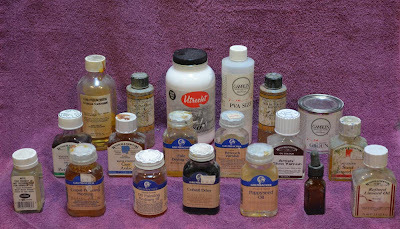 I have a question on using acrylic varnish over oil paint and does it adhere well. Also I followed a conversation on-line about the yellowing effects of Damar. Do you have an opinion on that? AS long as the acrylic is used as a final varnish it should be fine. Museums have been using it for over 80 years now in their conservation efforts with no adverse affects. As for yellowing, all tree varnishes will yellow over time. Damar is the best thing out there right now for traditional varnish. Acrylic is colorless and should not yellow although improperly applied acrylic can cloud or bloom. It took me a long time, and anguish, to decide what to use. I finally went with the acrylic and I'm glad I did since it can be removed without harming the oil painting. I tried an experiment on an old painting that did not matter. I have been surprised by how LITTLE I have seen online, at least from other artists, on the use of the acrylic varnish. Finally discovering that conservators preferred it is what convinced me. In fact one said it is BETTER than other varnishes because since it is chemically different from the oil painting and traditional varnishes. That makes it safer to remove, from a conservators point of view, because the solvents used to dissolve the varnish won't also dissolve oil paint, the varnish SHOULD be chemically different. My final question was WHEN is it safe to use over the oil painting. I had to contact the manufacturer to get the answer (on the can it said to wait 6 months, who can do that when a show is right around the corner? ), and was also told as long as it is dry to the touch ( I mentioned that I paint in thin layers, not thick impasto). But admittedly I was always little worried about that, acrylic on oil, I would not want a sold painting to go bad later.